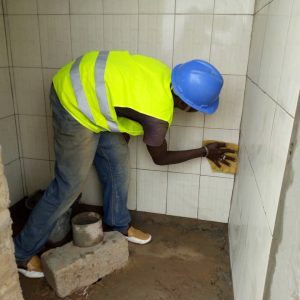 A new project to offer practical training skills to young people in Burkina Faso has already seen dozens gain the support they need to start out in a new trade. Based in two specialist vocational training centres in the north of the country, courses teaching a number of skills including electrical work, sewing, bricklaying, carpentry and tiling (pictured left) are on offer. Some classroom teaching is followed by extended placements with local businesses to perfect practical skills. Costing around £60 to train a young person, this is, we believe, a really effective way of offering the chance of developing a career and earning a living to more young people. Our students are drawn from communities where youth unemployment can be a significant problem and these opportunities are a welcome chance for a transformed future. If you would like to donate to this work, click here.